Earlier this year I decided I needed to get a new lawn mower. For years I have marched behind a push-mower in the hot sun, cutting my grass. I decided at that point to treat myself to something new. 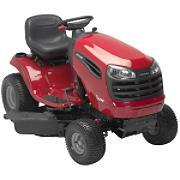 I purchased the Craftsman YT3000 21HP Lawn Tractor riding mower. Its a dark red color, doesn't show a lot of dirt even though we clean it regularly. The great thing about it is that it has a platinum engine with and oil filter, so its supposed to last forever now. The engine automatically cools itself and the performance on it is great. I have even used the bright headlights at dusk when i was driving around near a ditch in the back of the property. It came with a 2 year full warranty, but I decided to purchase the extended warranty. Probably not necessary, but I wanted to be safe. The salesperson at Sears was insistent on it. The mower drives very smooth and it goes pretty fast with 6 speeds. It handles very well when I whip around these bushes in the front and easily chops up everything I drive over. Even things I don't mean to chop up like the hose! One of my favorite features is the cup holder where I can put my fave cold beverage. I even cut our neighbors yard when they are out of town at their mother in laws for 2 weeks. They were surprised at how great their yard looked when they returned. I felt the price was really reasonable we got interest free payments on it and its almost paid off now. I bought this mower and within 2 hrs. the blade housing broke. Very cheap aluminum casing holds the blade. I called Sears and they told me that a service person would call me the next day. Never received a call. I called back and they told me the same thing. No call. I returned the mower back to Sears. It did cut very well, but the weakest link, should be the strongest link, not the case. I recently purchased my new lawn tractor from Sears this summer. After checking out a few stores and talking to friends, I came to the conclusion that craftsman would be the best deal. I have a large property, 2 acres, so I upgraded to a larger mowing deck which has already paid off. The lawnmower is surprisingly quick and cuts the time in half compared to using a push mower. In addition to a larger deck, I purchased a snow blade and snow chains for the tires, I have recently been using the mower to plow my driveway which is saving my back from some pain, but not completely due to the fact that the seat is a bit uncomfortable for someone of my larger size. Overall I am satisfied with my purchase and it makes maintaining the yard a much easier task.